After installing Windows, we all prefer to install latest versions of sound, graphics, bluetooth, network, card reader and other required drives. But sometimes when you install Windows on a PC, Windows fails to detect to the network adapter due to the lack of appropriate driver software. When Windows fails to detect the network card, obviously you can’t connect to the Internet to download and install the right network driver. There are tens of free programs available to automatically search and download the right drivers for your all PC components. But all these software require you to connect to the Internet to download the right network driver. Here is a very useful software that helps you when Windows fails to detect your network adapter due to the absence of right device driver. 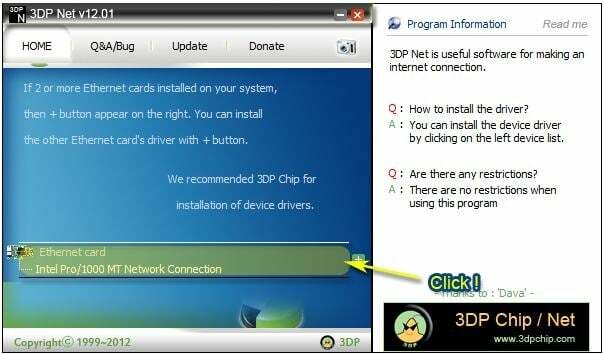 3DP Net automatically detects and downloads the right network driver for your PC, even if the the computer is not connected to the Internet. The program sports a basic user interface but it includes drivers for most of the network adapters out there. When you install and run 3DP Net, it searches for the network adapter installed on your PC and then installs the right driver from its integrated Ethernet card driver pool. It includes drivers for Broadcom, D-Link, Intel, Asus, Cisco and NVIDIA, Compaq, Marvell, Conexant, AMD, Agere, ICPlus, Samsung, SiS, Realtek, Texas Instruments, and many other cards. And once the driver is installed, you can connect to the Internet and use your favorite web browser to download sound, graphic and other drivers. We suggest you download and keep copy of this software on your bootable Windows USB or DVD so that you can easily install network drivers, if in case Windows fails to detect PC’s network adapter. 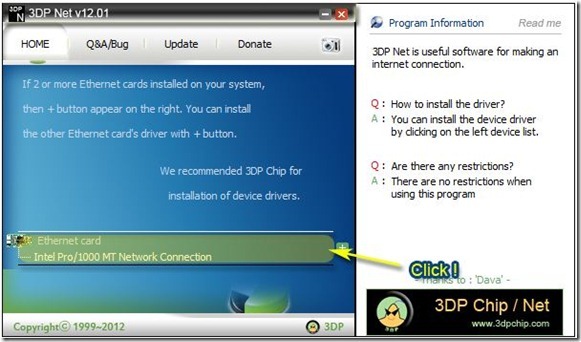 3DP Net is a free software and officially supports Windows XP, Vista and Windows 7 operating systems. In our test it worked smoothly on Windows 8 as well.